"Kuduro (or Kuduru) is a type of music born in Angola and immediately exported to Lisbon suburbs in Portugal. It is characterized as uptempo, energetic, and danceable. 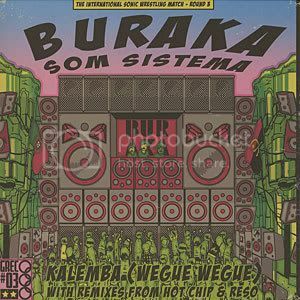 "The roots of Kuduro can be traced to the late 80's when producers in Luanda, Angola started mixing African percussion samples with simple Calypso and Soca beats to create a style of music then known as "Batida". European and American electronic music had begun appearing at the largest open-air market in all of Africa, Roque Santeiro market, which attracted Angolan musicians and inspired them to incorporate their own musical styles." So there you go, pretty cool and a nice addition to the DJ Mujava shizzle I served up last week I'd say. Moving on, I admit I was sucked in by the Hot Chip remix, pretty cool and works well when played at an offensively loud volume. I will admit though that trying to listen to all 3 mixes one after another left me feeling agitated and Kuduro'ed out.